I’ve recently been made aware of, and have been following, several current cases of farmers under attack by government. 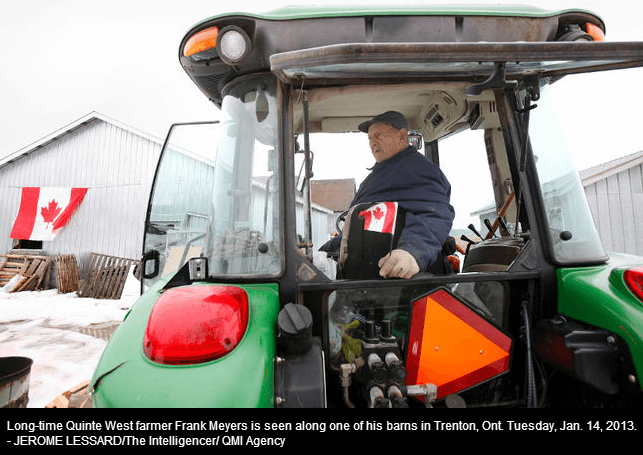 My awareness of these farm food freedom assaults began with the case of 85-year-old Ontario farmer Frank Meyers, who is, along with his supporters, fighting back against the Canadian Department of National Defence’s plan to expropriate his farm in order to expand CFB Trenton, the neighbouring Air Force base and Canada’s largest military installment. After blogging about the Meyers case, I was pleased to connect with Liz Reitzig of Nourishing Liberty, who introduced me to several ongoing cases involving the state targeting farmers for peacefully and voluntarily transacting with their customers. It was property rights violations – seizure of land and raids on farms, leading to theft and destruction of equipment and livestock – that initially interested me in cases such as those of Frank Meyers, Mark Baker, Montana Jones and Michael Schmidt. I was given cause to consider the source legitimate property ownership. The theme that Liz Reitzig promotes on Nourishing Liberty is the fundamental connection between food freedom and other human liberties. It’s true that without the ability to nourish the body, securing other freedoms – property, freedom of expression, economic, sexual and other freedoms – becomes challenging, to say the least. Why is food freedom so basically prerequisite to all other human freedoms? Our first and most basic right is that of self-ownership. The principle of self-ownership is evidenced by each person’s natural control of and dominion over their own body. The possession of any right, like the human right to life, implies the right to dispose of that right in any way. A man who is limited by another in his ability to dispose of his life as he sees fit – how he spends his time, with whom he voluntarily transacts and how he cares for (or abuses) his body, including what he eats – cannot be said to be free. If, as Michael Schmidt suggests, our rights are not granted by governments, then why is the legitimacy of legislation that undermines fundamental human freedoms so widely accepted, with so few speaking out against, and openly disobeying laws that threaten their rights to own property, feed themselves and freely associate? As I discovered when I set out to procure raw milk in my area, most farmers are not willing to openly defy oppressive regulations that dictate how they produce their products, and with whom they may voluntarily transact. A contact of mine within the Ontario raw milk underground suggests that this is due to fear of reprisal by the state in the form of fines, loss of legal licenses to sell their product, and even threats of imprisonment. 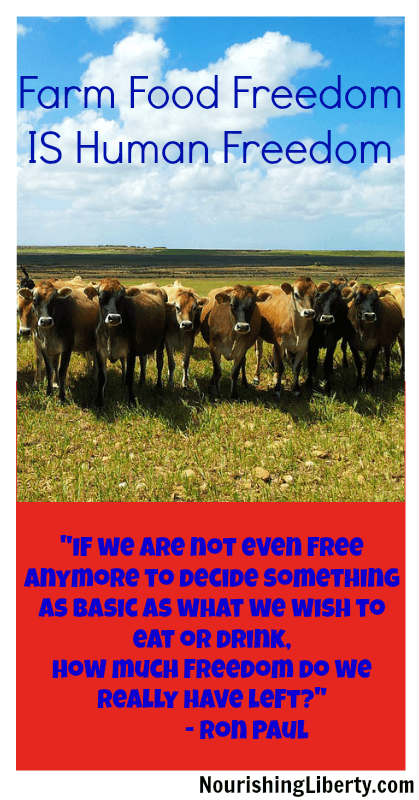 The same sentiment can be applied to raw milk and other issues of food freedom. I admire those like Michael Schmidt and Liz Reitzig who courageously speak out in open defiance of government assaults on these fundamental freedoms, but also empathize with those who are averse to the significant risks associated with acts of civil disobedience and non-cooperation. How can farmers, activists and advocates for food freedom strike a balance between promotion and demonstration of a truly free lifestyle, while mitigating risks and maintaining security against assaults by government? What is the best way to nourish liberty? Dean Tea is a blogger and advocate of peaceful and voluntary alternatives to government coercion. Having worked as staff for a Member of Parliament, he decided that the best path to freedom lies not within a system of coercion, but in the free marketplace of ideas. Based in Guelph, Ontario, Dean is a practicing agorist with the goal of living as freely and independently as possible. The Complete Patient asks: AFTER NEARLY 300 YEARS, CAN LAWTON’S FARM SURVIVE LOCAL REGULATORS OUT TO CRUSH RAW MILK?